Custom made sofas are a great option if you're thinking of buying a new couch. The sofa is often the most beloved piece of furniture in the house - and for good reason. It's where we snuggle in for watching TV, cuddle with loved ones, or curl up with a good book. It's often the central piece of furniture in the living or family room, and sofas occasionally make appearances in bedrooms, kitchens, and even dining rooms. Sofas are expensive, there's no getting around it. However, they last a long time and many of us will change houses before we change sofas, so it's important to purchase one of good quality that will last for many years. 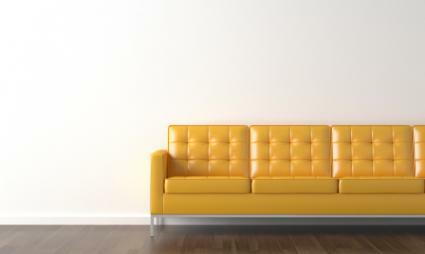 While they may cause a bit of a dent in the budget, remember that a top-quality sofa should stand up to wear and tear for 25 years, while mid-priced pieces typically last for at least 10. Because they're expensive and will likely be in your home for more than a decade, it's important that the couch you buy be just right for you and your family. Whether it's a small sectional or a large traditional style, make sure you get the best fit for your home and lifestyle. While it's possible to find what you want in a furniture store, custom made sofas are worth considering. Pick a fabric that suits your décor and lifestyle. Tailor the style to exactly what you want. If you want a modern couch but prefer the softer lines of more traditional sofas, you can combine the two to create a unique look. If you like a particular style but don't care for a few of the elements, simply remove them with a custom design. Specify the dimensions to meet your needs. If your home has unusually small doors, tight corners, or narrow stairs, you can have the sofa made to fit. Nothing is worse than getting an expensive piece of furniture home only to find that it won't fit through the door. A custom made sofa can erase this problem, especially in small spaces. Look for sturdy sofas with durable corners and frames made of hardwoods. Check to see whether the sofa is made using eight-way-hand-tied spring construction, which involves tying springs with eight ties to the frame. Choose a comfortable cushion, whether it is down-and-feather blend or spring-down or another variation. Sometimes you can buy directly from the manufacturer, and sometimes you have to go through a retailer that carries the work of certain sofa builders. It's best to do a little comparison shopping to see which option suits you best. While it may be cheaper to purchase directly from the manufacturer, it is sometimes easier to go through a retailer who will take care of all the small details as well as any problems that might occur. Many manufacturers such as Lee Industries will have store locators on their websites. Weigh the options before making a decision. It may seem like a bit of a daunting task, but designing a couch is easy if you take it one step at a time. Determine your budget. Remember to factor in shipping costs, taxes, and duties if it's being shipped from another country. Measure the space where it will go, as well as any doorways, stairways, or other factors that might come into play. Do a search and choose a manufacturer. Have a look through their catalogs for styles you like, or explain to them what you're looking for. Give them all of your details including the style of the room, the dimensions you desire, and your budget. Ask them to make some preliminary sketches. If you need to provide the fabric (some companies will take care of this for you), take the sketches to an upholsterer to find out how much material you will need. Choose fabric based on color, material, and price. Think about how you plan to use the couch. Is it likely you'll need to clean up spills? Will kids and pets be playing on it? Will adults solely use it for entertaining? All these factors come into play when choosing sofa fabric. Schedule a mover to take the frame from the manufacturer to the upholsterer if necessary. Sometimes one of them will be able to either do it themselves, or recommend a mover you can use. Then arrange to have the completed piece delivered to your home. If all of this seems a little overwhelming, you can always hire an interior designer to help you out. This type of request is very simple for a professional decorator, so they can get it taken care of in very little time. Keep in mind that lead times for custom furniture can be long, so always assume that it will take around 10 to 12 weeks to get it in your home. Nevertheless, once it's done, you'll have a brand new sofa that is tailored to your exact specifications.